Blog: Out of the Cage! The Algonquin Hotel in Midtown Manhattan has been the home to 12 cats residing within its legendary walls since the 1930s, including eight Hamlets and three Matildas. Each cat who has reigned at The Algonquin has been a rescue, with the current Hamlet VIII beginning his residence in September 2017, when Matilda III retired and was adopted by a member of the hotel's staff. The Algonquin adopted Hamlet from Bideawee in Wantagh, Long Island, where he resided after being found as a stray living in a feral cat colony. Hamlet sports the signature Trap-Neuter-Return (TNR) "eartip," which signifies that he has been neutered. Very popular with hotel guests, The Algonquin Cat receives fan mail and gifts from all around the world. 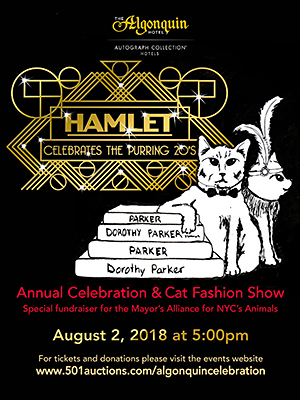 Each summer, The Algonquin Hotel opens its doors to celebrate its special feline resident with a party, cat fashion show, and adoption event benefitting the Mayor's Alliance for NYC's Animals and promoting cat and kitten adoption in New York City. It's not quite New York Fashion Week, but eight felines will be strutting their stuff in one-of-a-kind outfits designed by certified animal fashion designer Ada Nieves in celebration of The Algonquin Hotel's most famous resident, Hamlet, The Algonquin Cat. This year's theme is The Purring 20s! Guests are encouraged to wear their best feline-inspired outfit and share photos from the event on social media using the hashtag #AlgonquinCat. 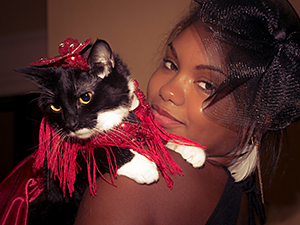 Tickets are available for $75 per person, which includes the reception and cat fashion show. 100% of the proceeds will benefit the Mayor's Alliance for NYC's Animals. For additional information, to purchase tickets, or to bid on silent auction items, visit bit.ly/AlgCat2018.